Today, online banking has become a day to day life activity. Online banking services have eliminated the need for standing in long queues in the banks. Now, most of the banking can be done from online mode anytime any place. Banking provides OTP SMS Services on phone number to customers because of it helps not any others person use your account. This saves a lot of time and effort for the customers and has improved the user experience to a great extent. But if there is money involved in anything, it will attract spammers and fraud activities. For making the transactions secure, banks are using OTP (One Time Password). 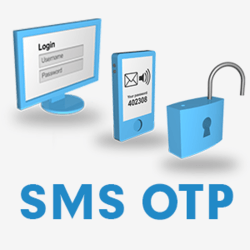 OTP SMS Services is a technological mechanism through which a one time password is generated before the transaction. It is an SMS that is received by the user on the registered mobile number whenever the transaction is being made. This makes the transaction more secure. OTP is also known as two-factor authentication. It helps in identifying the authenticity of the customers and prevent the potential threats. Most of the people access important facets of their life like banking, shopping, insurance and so on just by the click of the mouse or touch of their smartphone For getting the access to these systems requires one-factor authentication that is the correct combination of username and password. In reality, one-factor authentication is less secure. Many people choose passwords that are easy to guess like their name, date of birth etc. Lots of users use same username and password for different websites. This can make the situation more vulnerable. It is difficult to identify the person online due to several reasons. If numbers are to be believed, every year around 15 million people in the United States become a victim of online fraud and had to face a loss of $50 billion. The use of OTP has improved the customer security and saved the customers from online fraud activities to a great extent. OTP SMS Services helps by adding another layer of security to protect the identity of the user. Let us understand the whole concept of OTP in simple terms. Almost every user in the world is having a mobile handset. SMS is the basic functionality that is available in every mobile. Whenever the user is going to access the account or initiating a transaction, he/she is prompted for the username and password. When the user is authenticated in this layer, the user is prompted to type the one time password that is sent to the user’s registered mobile number. The user is allowed to access the account only if the correct password is provided by the user. The password must be provided to the system quickly as it has a time frame associated with it because One Time Password expires in several minutes. Now, let us understand the process that happens before the OTP is authenticated. OTP is generated either through the mathematical function or through the time. In the time-based OTP generation, the device is n the sync with the authentication server to create the one time password. In case of OTP generated by the mathematical function, a mathematical function is called to generate the OTP. SMS is the most common way to receive the SMS request. It OTP message fails to deliver, the user has the option yo to resend the OTP. OTP is valid for single login only and is not vulnerable for multiple attacks. OTP is generated randomly and they have an expiry time of few minutes. So they ensure high-level security. SMS are the most cost-effective way to send OTP to the users. OTP eliminates the need for the user to create, maintain and remember passwords and also it saves from the potential password threat. Delivering the OTP to mobile phones is simple and secure as mobiles are carried by the users all the time. There is no need to carry any other device to view the OTP. SMS is known to all and has maximum outreach as it is easily accessible to all. The benefits of using two-way authentication using SMS is a great way to eliminate the potential threats in the transactions. OTP is meant to make transactions more secure and less vulnerable to cyber attacks. Also, it is a cost-effective way that does not put extra load on the budget of the businesses. Banks are now stepping towards the multiple factor authentication that uses handheld card readers, generating one-time password and credit card number to make the transactions more secure.